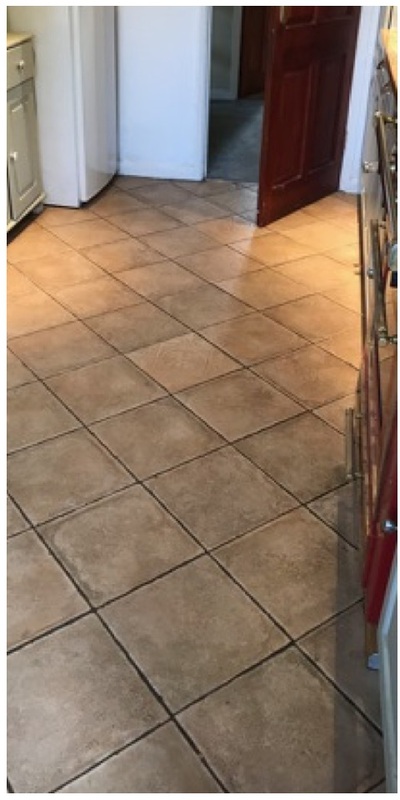 This customer from the picturesque town of Henley on Thames got in touch to ask about cleaning and sealing her Ceramic tiled kitchen floor. Now Ceramic tiles are glazed and so normally won’t absorb a sealer so intrigued I scheduled a time to pop over and take a look. When I got here I could see the tiles were in deed dirty but as I suspected they were not Ceramic but micro porous Porcelain which does need to be sealed. In this case the sealer had worn off and dirt had become ingrained in the tiny pores of the tile. The tiles were a Terracotta style Porcelain, but this was hardly recognisable due to the accumulation of dirt. I discussed all of this with the owner and agreed I would give the tile and grout a thorough deep clean and then reseal them to ensure the dirt was kept out of the pores in the Porcelain going forward. As well as cleaning the floor I would need to remove any trace of original sealer if I was to achieve a consistent appearance later. To achieve this, I soaked the tile in a strong dilution of Tile Doctor Pro-Clean which was then left it to dwell for ten minutes, so it could get to work on breaking down old sealers and dirt. The next stage was to work the Pro-Clean into the floor with a rotary floor buffer running on slow speed fitted with a black scrubbing pad. The cleaning solution soon changed colour with the dirt that became released. The floor was rinsed with water and the soiled cleaning solution extracted using a wet vacuum. The grout given the same treatment but this time by hand using a stiff brush and more Pro-Clean. The floor was then rinsed again with water and then dried with a wet vacuum. Being micro-porous Porcelain, this didn’t take as long as clay tiles such natural Terracotta or Victorian. The floor was then left to dry and I returned later to re-seal it for which I used a couple of coats of Tile Doctor Ultra Seal which is a natural look sealer that protects the tile from within by impregnating the pores in the tile with sealant thus preventing dirt from becoming trapped there. I think you will agree the floor now looks much cleaner and fresher, certainly my customer was happy with transformation and left the following note on the Tile Doctor feedback system.